Hellerman, Joseph. Philippians. Exegetical Guide to the Greek New Testament, ed. Andreas Kostenberger and Robert Yarbrough. Nashville: Broadman and Holman, 2015. 297 pp. I’ve had quite a bit of training in Greek. I completed twelve hours (4 semesters) of Greek in college, three additional semesters of Greek in graduate school (9 hours), and then three Greek exegesis classes in graduate school as well (9 hours of coursework through Matthew, Galatians, and Hebrews in Greek). With that said, I still do not consider myself to be a Greek scholar by a long shot. I can sight-read in the Greek New Testament, and I know my way around translating and using the textual apparatus. So I can swim in the Olympic-sized swimming pool of Greek, but I’m not going to be trying out for a swimming team anytime soon. I’m competent but not an expert. That’s why I’m particularly excited about and thankful for the Exegetical Guide to the Greek New Testament series from B&H Academic. This series is tailor-made for students and pastors like me. 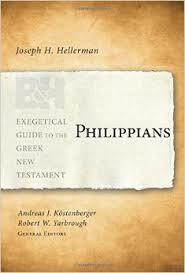 I recently had the opportunity to read through a recent release in the series, Philippians by Joseph Hellerman. A few years ago I preached through Philippians at First Baptist Church Henryville, and a quick look-through of this volume certainly makes me wish I had been able to use this resource for that series’ sermon preparation. Joseph Hellerman (Ph.D, University of California, Los Angeles) is Professor of New Testament Language and Literature at the Talbot School of Theology where he has taught for more than ten years. A member of both the Evangelical Theological Society and the Society of Biblical Literature, Hellerman has written widely in both books and journal articles within the field of New Testament studies. As I mentioned above, I’ve been genuinely pleased with the volumes in this series, and my thoughts on Hellerman’s recent addition to that series are no different. Some of the many strengths of the volume include Hellerman’s detailed study of the grammar and syntax of the Greek text, textual and suggested homiletical outlines, thorough contextual and cultural backgrounds to the text, and suggested resources for further study and consultation for preachers and teachers. This technical-syntactical commentary is well organized, structured, and user-friendly, with one major caveat following. The book’s one major caveat is that it is exhaustively limited in its general usefulness to a general audience. Without a solid background in New Testament Greek the work is practically unusable. That means it is outside the realm of normal use for the ordinary layperson or beginning Greek student, whether they are in college or seminary. This is not a resource that can be casually recommended. If, on the other hand, you or someone you know is a professor, pastor, or student who is at the very least competent in regularly using the Greek text, then this volume (along with the other works in the series) is an extremely helpful guide to the complexities of correctly interpreting and preaching the New Testament books from their original language. I would go so far as to say that if you are able to work with New Testament Greek to some extent, then you would be well served to make use of this volume and the other works in its series. Cade Campbell is Associate Pastor for Preaching and Discipleship at First Baptist Church of Henryville, Indiana. You can follow him on Twitter at @DCadeCampbell.